I have always enjoyed learning the lingo and pronouncement of bayou names and place names used by the Bayou Pigeon people. Place names for certain features / landmarks in the swamp are very important because they can be related to each other in terms of their physical position which is used in communication with others. I quickly learned from my Cajun friends growing up the names of these important reference points. To this day, my friends and I, particularly Anderson (Gut) Hebert and Johnny Johnson can give each other a reference point and know exactly what / where the other is talking about and the casual swamper / outsider not have a clue where we are talking about. The origin of the name ToBY’s (2b’s) Point may be loss to history. It’s origin and how it should be spelled is loss to all the people who I have spoke with who came of age in the 1940’s and 50’s. They all know of the name, but how it came about is not remembered. I speculate it may have been named so after someone with the first name Toby. Cajun slang could have been 2 b. What ever, it is fairly certain it came from the 1930’s or before. Because Mr. Felix Berthelot and others of his generation do not how it got the name. There are 3 important reference points on Little Bayou Pigeon between it’s source at Grand River and it’s junction with Big Bayou Pigeon. They are Justillien Road, see page 663 in the Bayou Pigeon book, the Long View, see page 659 and ToBy’s (2B) Point, not mentioned in the book. Thus the need for this story. The map below gives there relative locations. The picture below gives perspective of ToBY's point relative location. 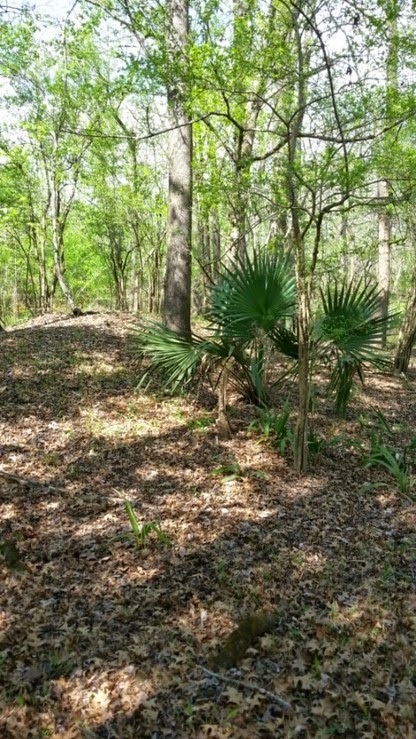 ToBY’s Point is called a “Point” because the land extends out into the water of the first ‘S‘curve in Little Bayou Pigeon from it’s source Grand River. ToBY’s Point - What is it? A natural levee forms along a stream when the water leaves the confines of its channel during flooding and deposits coarse grained material adjacent to the bank edge. This coarse-grained material continues to accumulate, due to subsequent flooding, and a natural levee / ridge is formed. Natural ridges always slope sharply toward the stream and gradually away from it. The natural ridges of ToBY’s point look too high to me , relative to rest of the ridge along Little Pigeon to be formed under typical circumstances to me . Thus, If they were formed naturally something else must have been going on at that point on the bayou to cause the unusual high ground. 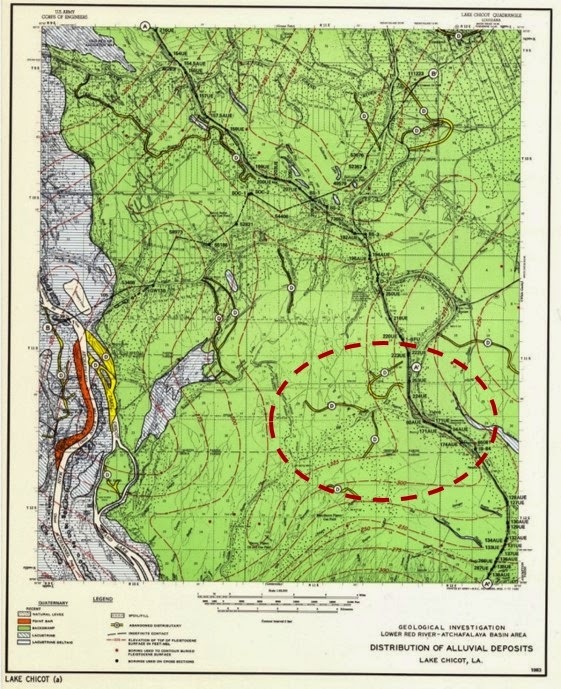 I have a theory… a special Map, results of an geological investigation of the Atchafalaya Basin Lake Chicot quadrangle area. Reveals some interesting history something that occurred a long time ago. Over time, rivers and streams move across their flood plains, this is known as meander scrolls. New areas of land ridges and swales are always being formed. 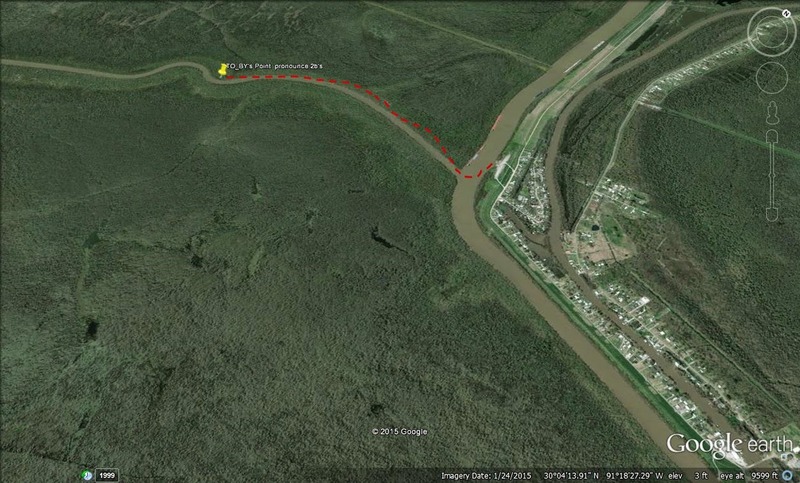 This is well understood locally with the Mississippi river, and examples like False river new Roads, LA. In addition there is constant deposition of material from overflowed channel banks. The map above shows three abandoned distributaries / streams around 2b’s point in Little Bayou Pigeon. 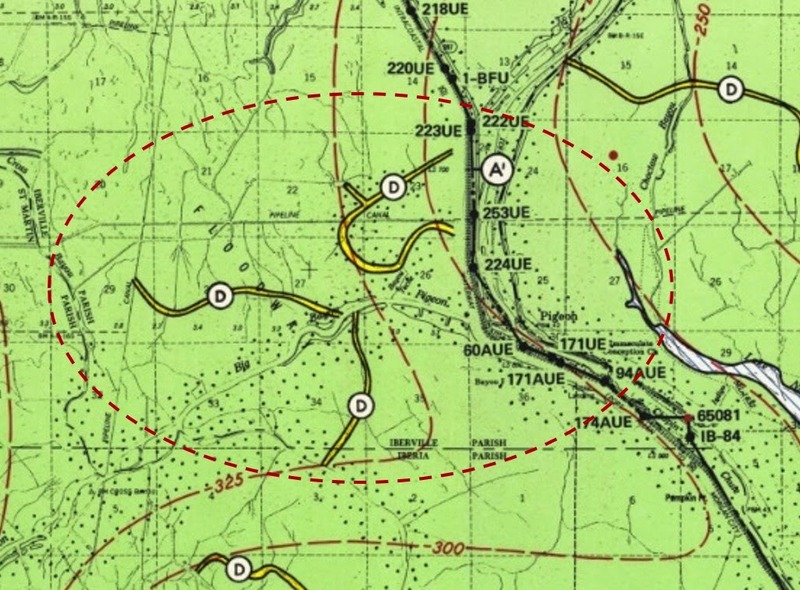 One abandoned stream is clearly a meander ( route) of Old Grand river, maybe centuries ago. 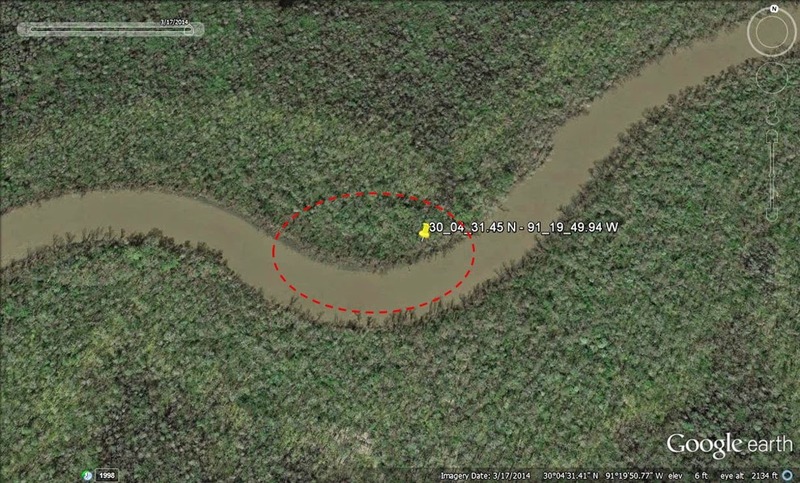 The East Atchafalaya Basin Protection levee makes this harder to recognize. Today, we locals call that old Meander, Bayou “Sec” with an S, which on the map someone at USGS labels as Bayou Teche, like the Teche on the west side of the Atchafalaya Basin. Another is clearly what we call Justillien Road was a long time ago. The last looks like it has some kind of connection to Cross Bayou, but is unclear to me where was an origin. 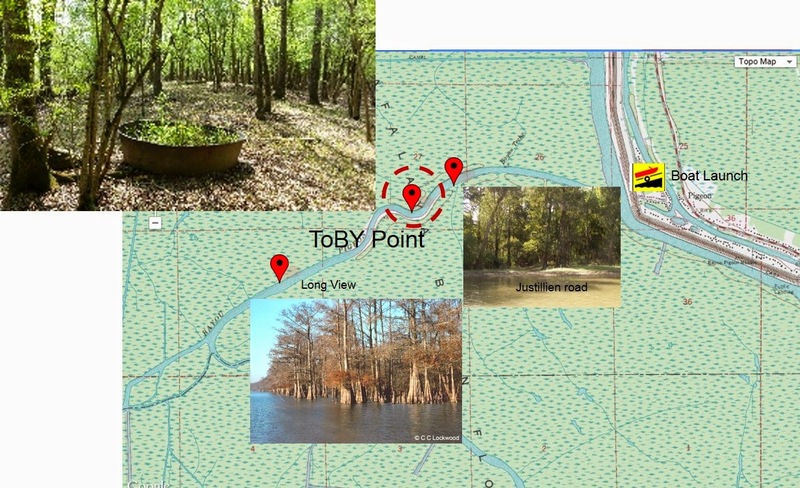 Whatever, the last two abandoned streams look like they could have interconnected / intersected with Little Bayou Pigeon at what we call ToBY’s point. Maybe this tri-fecta of streams is responsible for unusual natural deposit's of ToBY’s point. 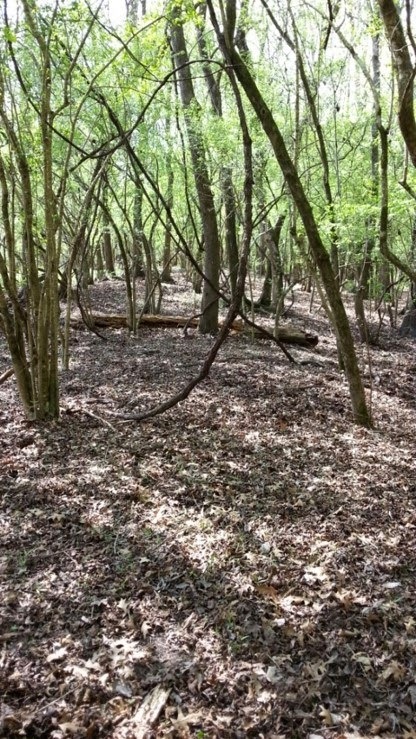 The high ground of ToBY’s point was a work place for the old time commercial fishermen of Bayou Pigeon in the 1940’s and 50’s because it was one the few spots in the swamp that did not go under water every year. In the era of cotton hoop nets when fishermen had to tar their nets frequently, to keep them from rotting. ToBY’s point became a net tarring place. 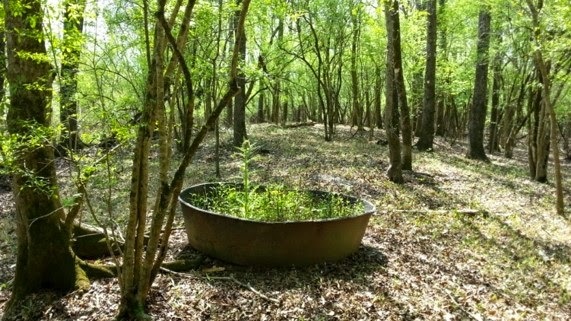 There is a still a large metal vat and lots of big clumps of cold tar on the site. The tar was heated in the vats by wood fires. The vat pictured here is said to have belonged to Orelle (aka R.L.) Frioux and Guildy Landry. 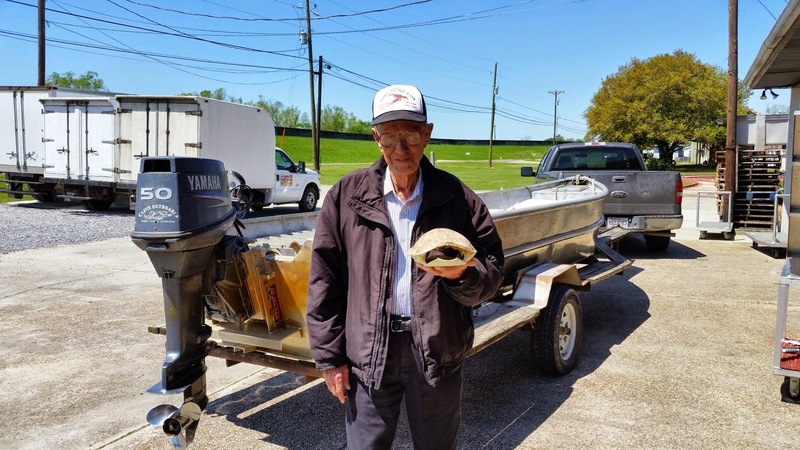 Although several folks that I have interviewed said it was used by a number of different fisherman, Wilbert Hebert, Dudley Hebert and others. Tarring nets was a hot, smoky and messy job and therefore selection of sites were chosen to keep it as far away from the house as possible. ToBY’s point was not just near the job site it in was at the job site! Mr. Felix Berthelot born in 1925 on Indigo Bayou is a great story teller. 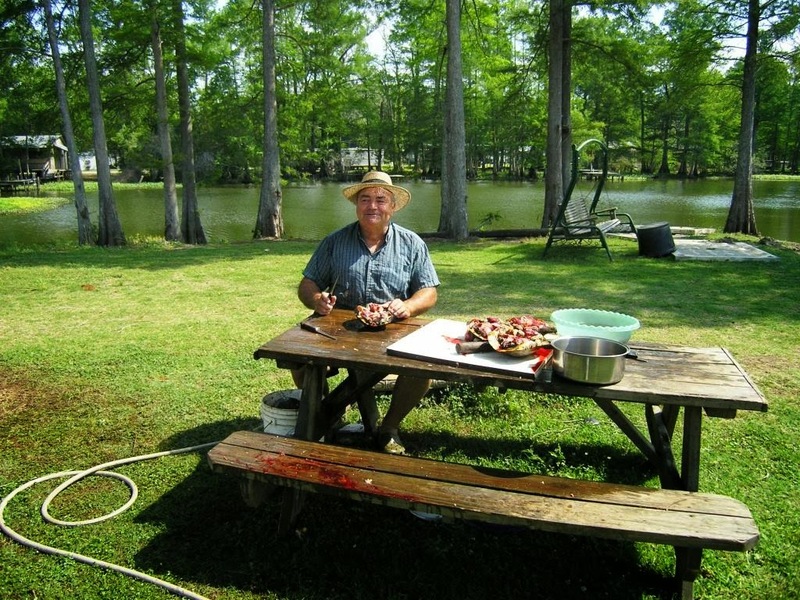 He has spent his entire life at Bayou Pigeon and there is not much about Bayou Pigeon that he does not know. He is quick to point out to us that in the old days people lived a simple life; they grew, caught, trapped or killed their next meal. He tells the story that ToBY’s point was famous for Turtles. Turtles make their nest and lay their eggs in the spring time, the high water time of the year in the Atchafalaya. Guess what ? You have just seen the high natural ridges of ToBY’s point. Where do you think the turtles go to lay their eggs? A fishermen headed out to the bayous for a day of hook and line fishing and / or running his hoop nets at that time of the year could always count on finding a turtle both going and coming at ToBY's Point. Mostly “mobelians”, the kind that crawl on logs to sun themselves. It just so happens, that I decided to stop off on ToBY’s Point on March 26 to look around. 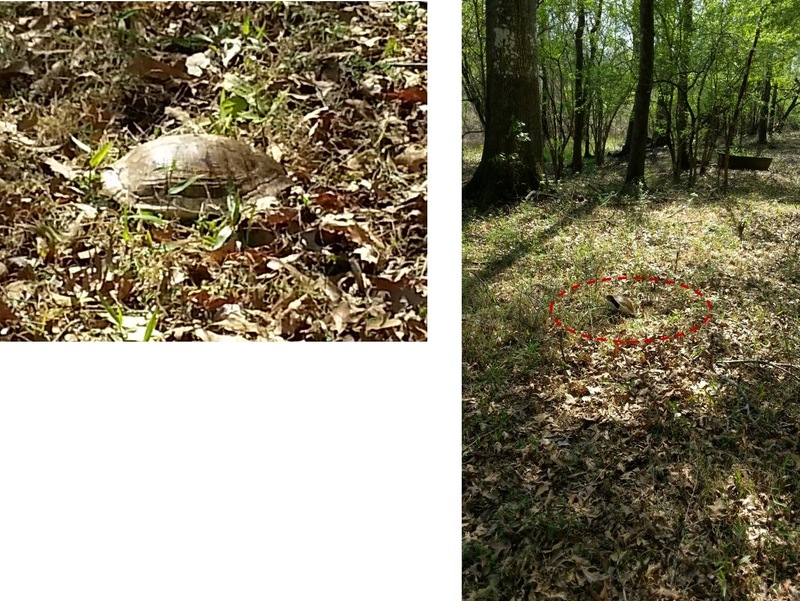 I did not go more than 15 – 20 yards on the hill and came across a turtle shell. I stopped by Mr. Felix’s dock and showed him the turtle. Turtle meat has a good taste and was a easy meal for the folks in the Golden Era of Bayou Pigeon. That is not to say, that it is a thing of the past ! 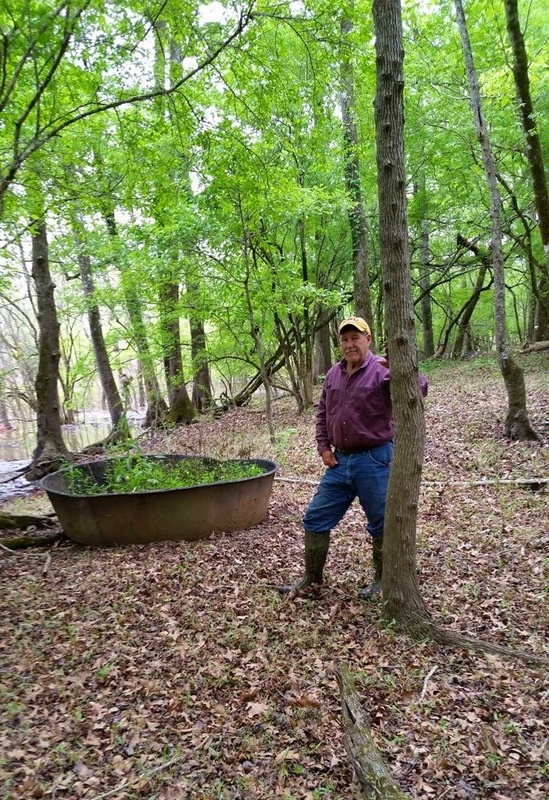 Milton Vaughn, cleaning turtles ( some mobelians) behind his home on Little Bayou Pigeon, 2014. I don’t claim to be cook, in fact I don't even like to talk about Cooks… but I have watched our 10 Gun Camp cook Anderson (aka... Gut) Hebert, cook for near 40 years and he cooks every thing basically like this. Season the meat with dashes of salt and pepper, add a small amount vegetable oil to a cast iron or aluminum pot. When hot, add the turtle meat and brown over high heat until deep brown and until some of the browning sticks to the bottom of the pot. Stir constantly. After the meat is browned , add the onions, bell pepper, and garlic, the Tabasco sauce, stewed tomatoes, Rotel, and tomato sauce and add water to cover the meat. Cook with the pot covered under low heat so the mixture simmers (lightly boils). Keep adding water so the meat stays covered. You need to cook long enough so the meat is tender. Taste and add more seasoning (or salt and pepper) to taste. When almost done, add the chopped green onion tops and parsley and cook another 15 minutes or so.